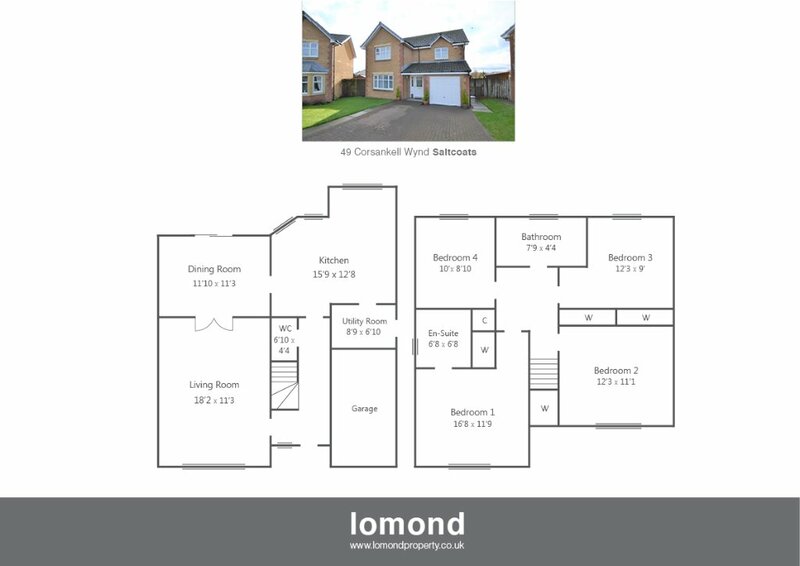 Situated on a large corner plot, with south facing gardens, 49 Corsankell Wynd is a detached villa offering everything the modern family seeks. The property boasts four bedrooms (master en suite), lounge, dining room, dining kitchen, utility room, and family bathroom. Further benefits include downstairs WC, off street parking and garage. In summary the property layout extends to a welcoming entrance hallway with stairs to the upper level and WC off. The main living space comprises stylish lounge with neutral décor leading to the formal dining room with patio doors to the rear garden. To the rear of the property the “L” shaped kitchen comes well stocked with integrated double oven, gas hob, and hood. A utility room off the kitchen completes the ground floor. The upper level houses four good sized bedrooms, three of which come with fitted cupboard/wardrobe space. The master bedroom benefits further from a luxury en suite shower room. The family bathroom is located on the upper floor and comes with bath, over shower, WC and WHB. Externally the property is located on a large corner plot. To the rear the gardens are south facing, laid to lawn with patio area and timber shed. To the front there is off street parking leading to the garage.